A fantastic five day trekking adventure through the colourful region of North India, which lies in the heart of the world's highest mountain range. Spectacular, spiritual and sublime - just some of the words to describe this fascinating country. Explore the kingdom of Gaddi, pass Hindu temples and Buddist monasteries with the spectacular Himalayan mountain range as our back drop. We end this incredible challenge with time to explore the incomparable Taj Mahal. Join us and discover India! Hospice at Home West Cumbria are working with our partner Global Adventure Challenges to bring you this fantastic opportunity. Take on this amazing personal challenge and raise money for your local hospice through sponsorship. This is a challenging trip. 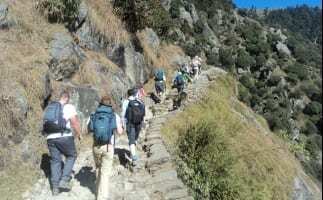 You will trek 52 km across uneven terrain, a level of fitness is required. Global Adventure Challenges will be with you every step of the way with advice and guidance to support you in your challenge.